Hey Everybody, Alex Here...The Holiday weekend is over and we managed to get a lot of little things taken care of around the house. 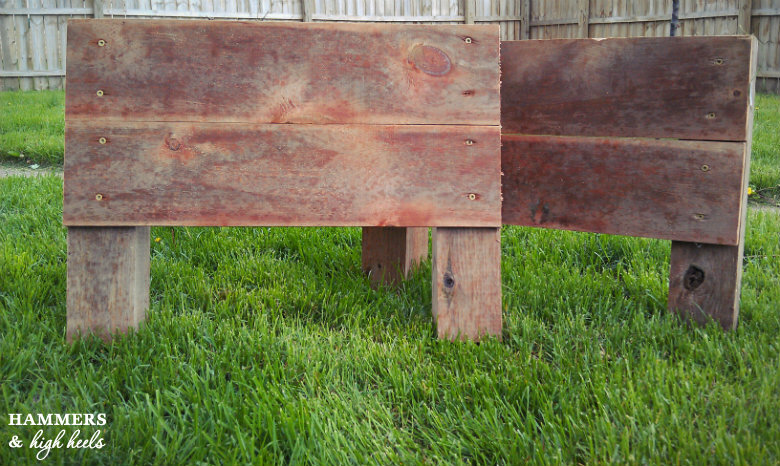 Yesterday, Carla had her hands full with some front yard/curb appeal projects and I got my hands dirty in the backyard with the simple but fun project below. 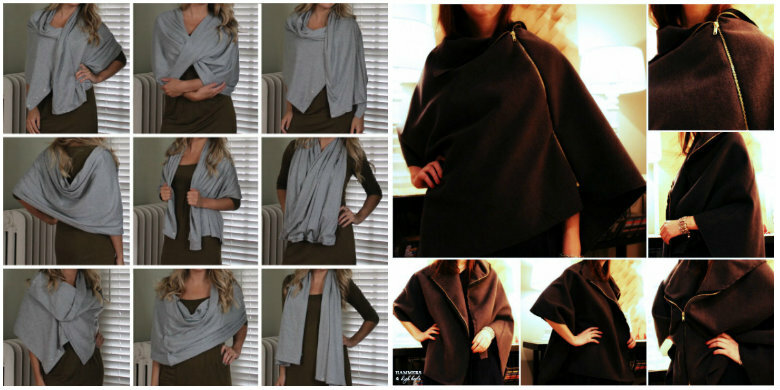 I hope you enjoy and maybe even try making some of your own. 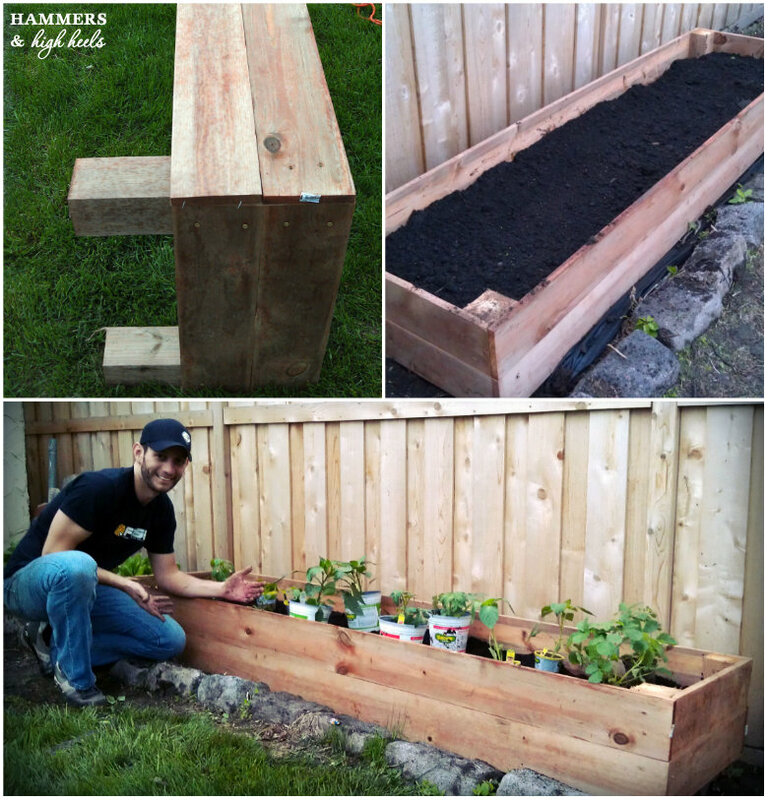 These elevated garden boxes were ridiculously easy to build and install and the new “Cedar Toned” Pressure Treated lumber that I picked up at Home Depot made for a very classy look (at a fraction of the standard Cedar price) for our back yard. Here’s a list of materials that you’ll need to make three of your own garden boxes measuring 8' length x 2' width x 1' height. ??? – Dirt/Plants/Seeds of your choice! To start with, my design would use five of the 1'x6'x8' boards for each box. 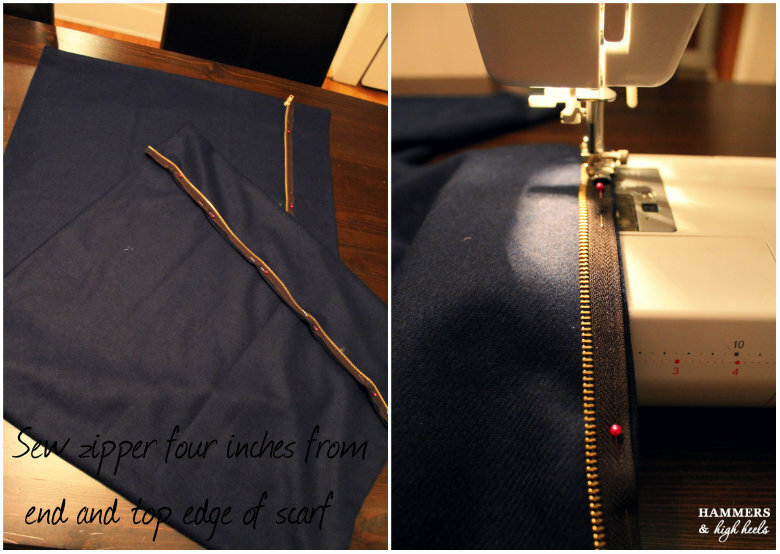 Four of these would remain the full 8' length and the fifth gets cut into four equal 2' lengths. I then cut one of the 4x4x8’s into 5 chunks that were each 18” in length (only 4 are used per box so you will have some scrap lumber unless you decide to cut them all at 24”). Next, I assembled what would become the box ends by screwing two of the 1'x6'x2' pieces level to the tops of two of the 4"x"4x18" “legs”. The final construction step was simply connecting the two ends using four of the 1x6x8’ boards. 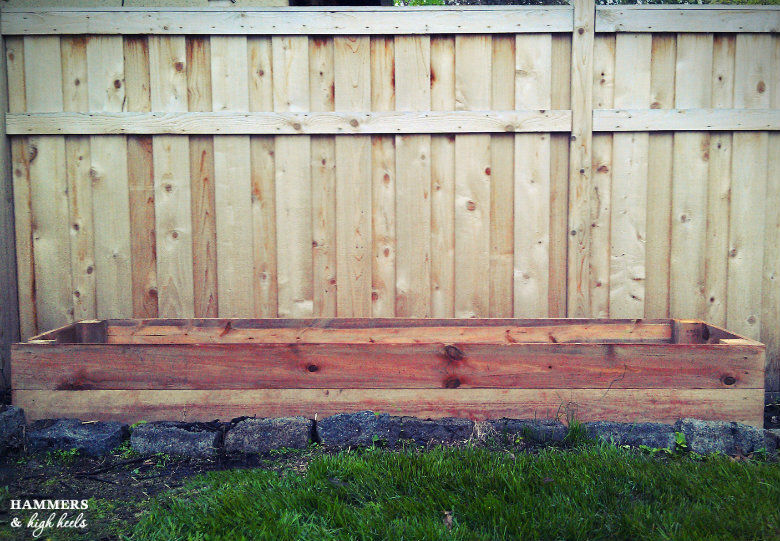 To accomplish this, I spaced the ends apart and squared the 1'x6' boards in place and attached with the decking screws. 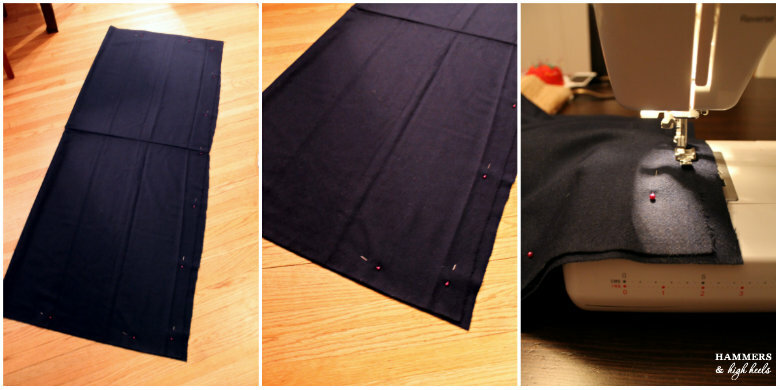 Repeat this step for the remaining “long side” and then you’re ready to place in your desired location. So Easy!! We chose to place the completed boxes along the southern fence border of our yard. This area should get plentiful sunshine and was in desperate need of a little pick me up anyway. Once our location was decided on, I cleared some existing vegetation and did a little work to level the ground before “dry fitting” the garden box in place. After the test placement, I grabbed my post hole diggers and dug out 4 holes for the 4"x4" legs to fit into. These are really just to stabilize the box and prevent it from shifting (If you’re in the mood for something more permanent you could always use longer legs and then cement them in place). Before dropping the legs into place and filling with dirt, I dropped down a good double layer of the weed block fabric to prevent any unwanted plant life from sprouting up. Now, simply add dirt and the fruit/veggies/flowers of your choice! 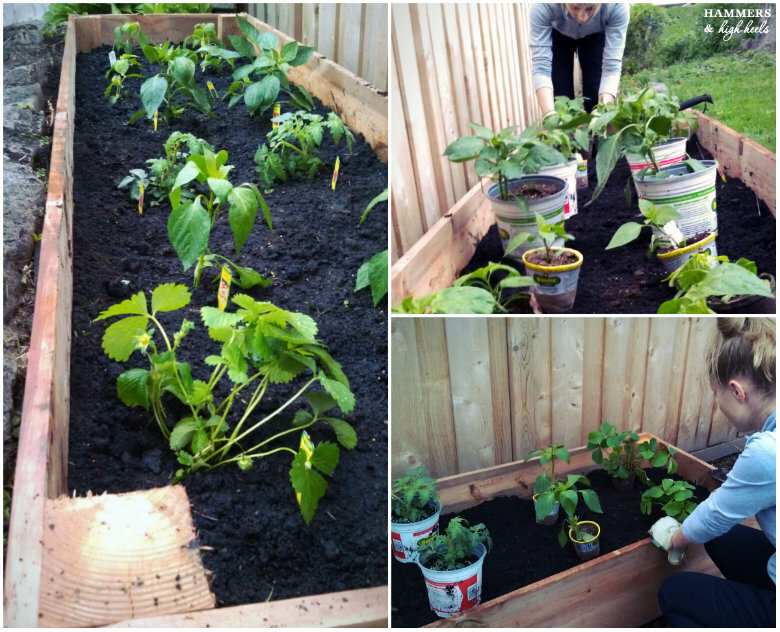 We had quite a bit of fun planting our first garden together for this project and it is a great addition to our backyard! The relatively low cost of completion and seriously short amount of time required to build will be fresh in our minds later this summer when we have some great homegrown fruits and vegetables on the table! 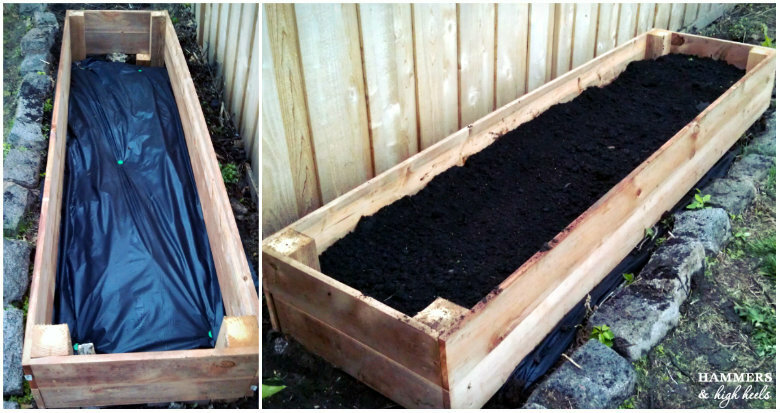 What do you think of our DIY planter/ garden boxes? What are some good tips/tricks for growing your own fruits and veggies? It's our first attempt at growing our own and I hope they turn out. 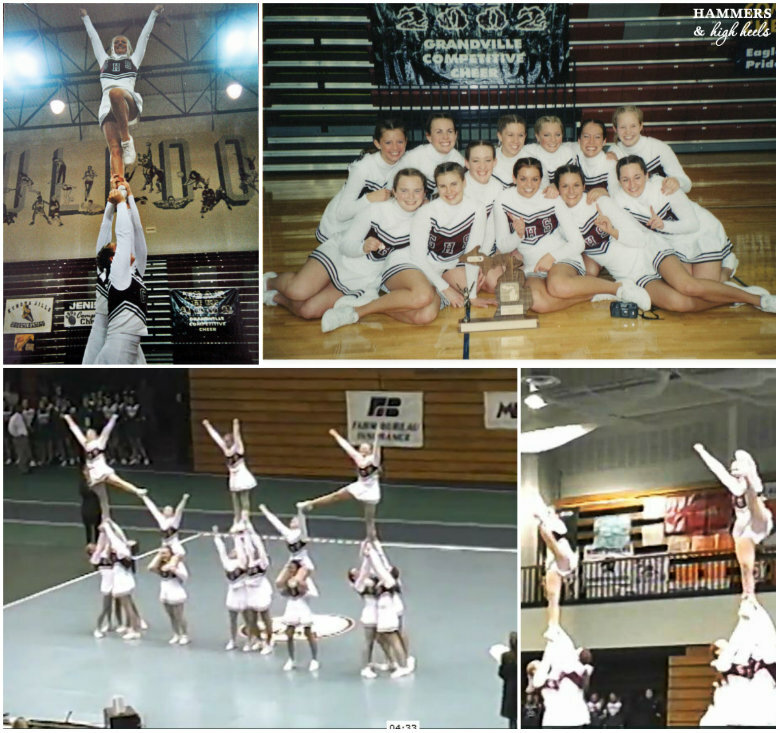 If you have any tips please let us know! 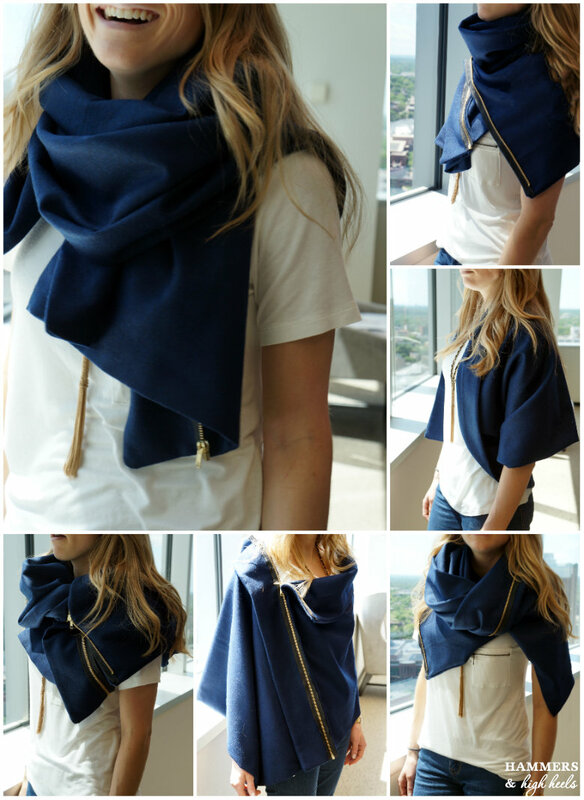 Head Over Heels DIY Friday: Summer Style Kick-Off for Memorial Day Weekend! Let's be honest, when it comes to Memorial Day weekend who can think about any kind of project when it's the official kick off of Summer?!? I know I can't right now, all I can picture is BBQ or picnic food, ice cold cocktails, and diving head first into warm weather fashion (finally!). 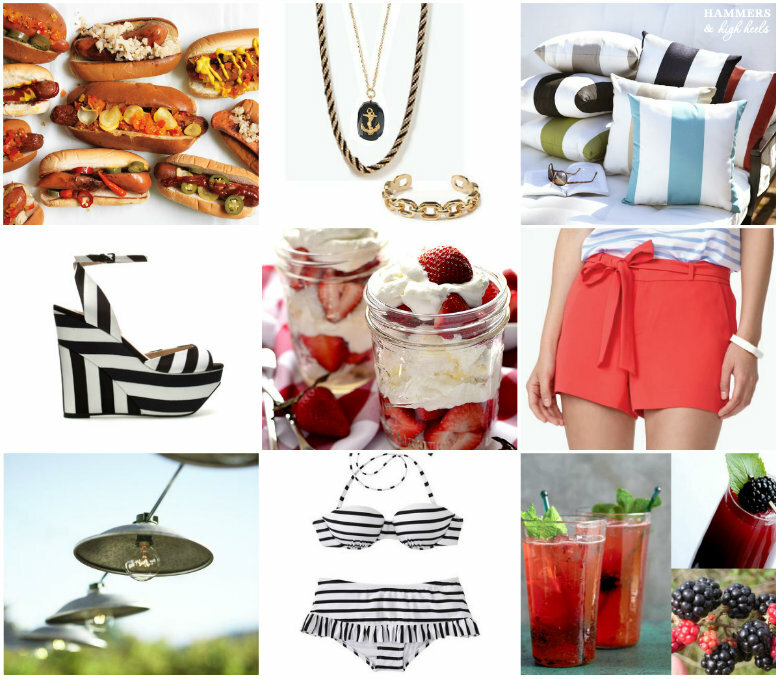 So this week I wanted to share my style inspiration and party ideas for Memorial Day weekend- let's take a look! Anything striking you too? I'm dying to get those stripe wedges and the pleated red shorts, how cute would that look with a white tank on top? I'm loving it all really though I guess, but right now I really want a hot dog now, LOL! Head Over Heels for hot dogs, ha! Alright, I'm otta here! It's time to unplug for this three day weekend so Alex and I can (try) to relax and enjoy! 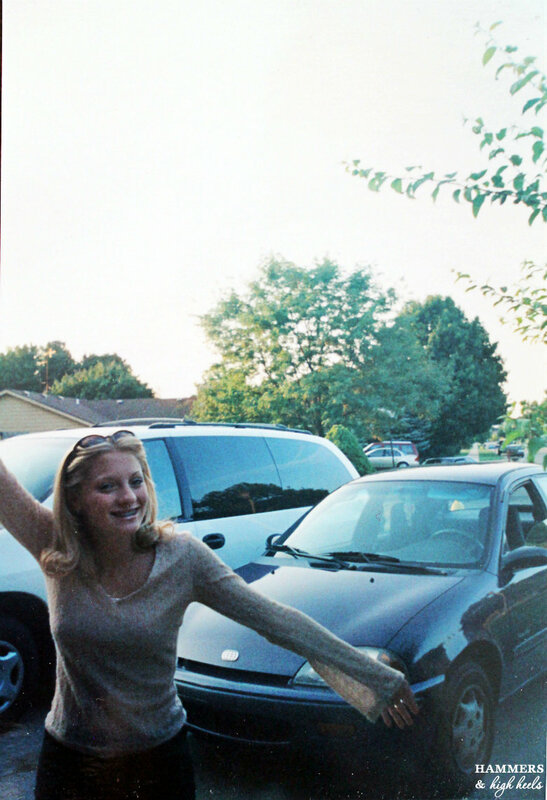 Woo-hoo, it's summertime ya'll!!!! What will you be up to this weekend? What summer fashion favorites are you excited to pull out from storage or purchase? Hope you have a gorgeous weekend with family, friends, food and fun! Cheers! For now at least :) I guess what I've learned from taking on this project is that I'll likely keep messing with the space because it's strangely kind of fun. Anyone else have a room they tinker with a lot too? Maybe it's because I'm the only one using the room and can do whatever, or I just enjoy reorganizing it all as my storage needs change? Who knows but the important part is that I've got all new 'after' photos to share with you today! 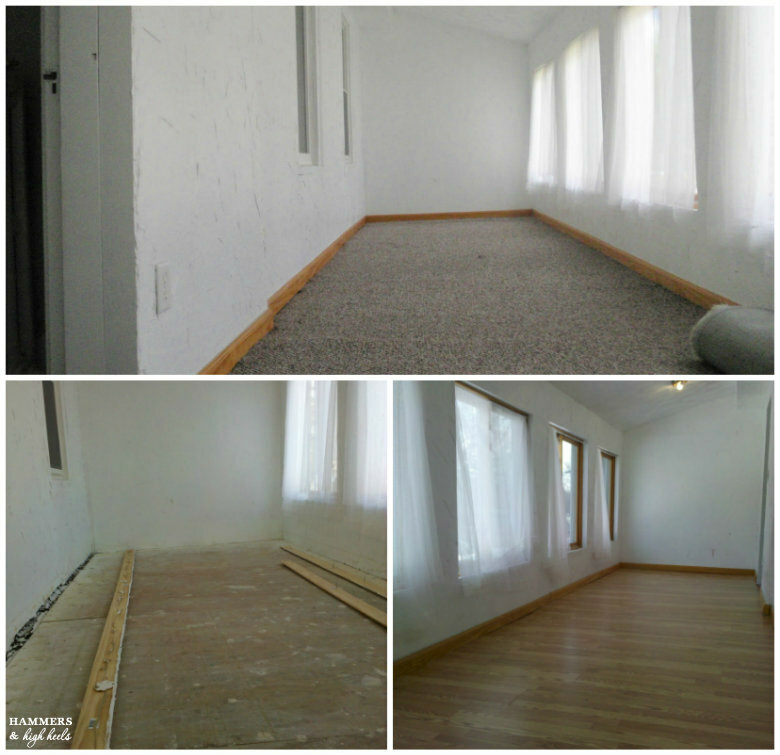 When we first moved into the house we weren't quite sure what to do with it but knew that the icky carpet had to go! It stayed empty for another year and then after seeing some glamorous "dressing room" photos, I was inspired to create my own! 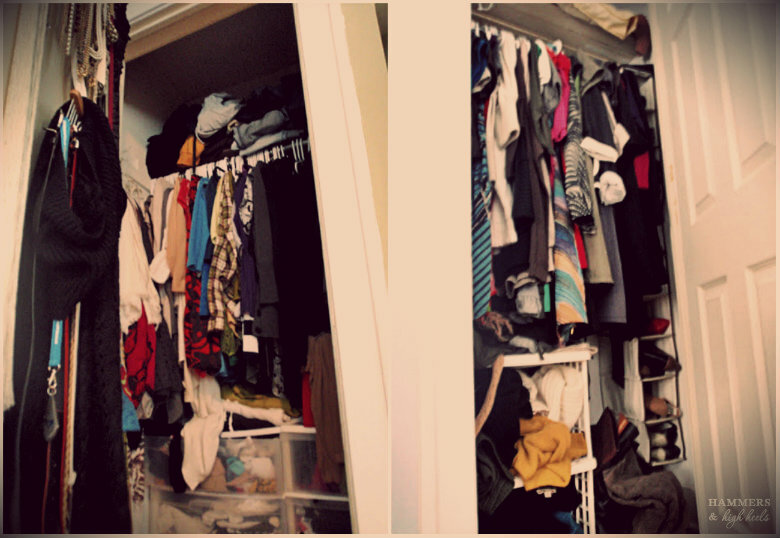 Not to mention that I could no longer stuff everything into an itty-bitty closet, oh the horror! 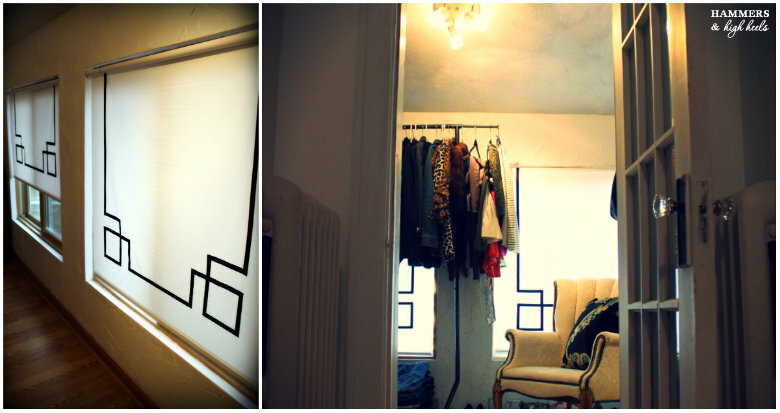 With that, let's take a look at my new (DIY) Closet photos! 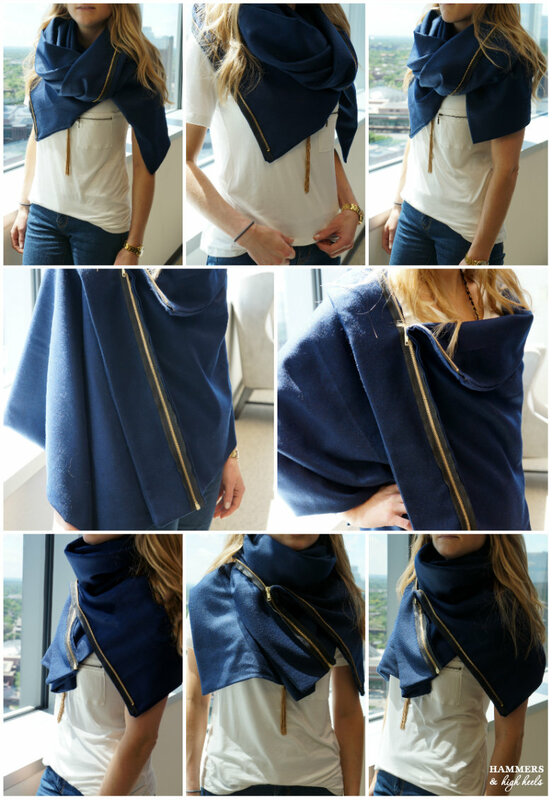 Here are the details that brought it all together! 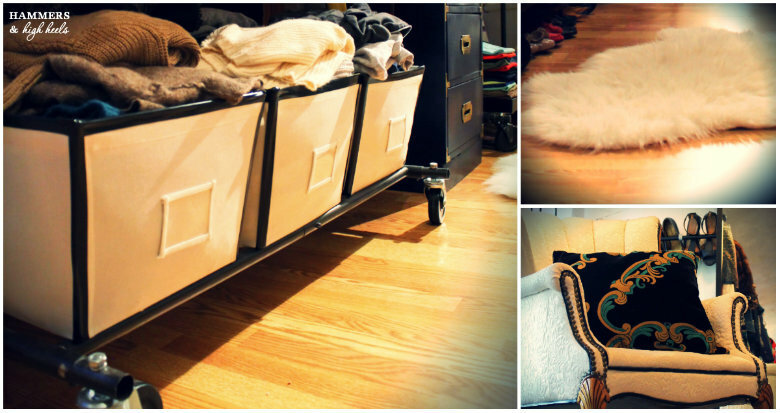 But my proudest DIY creation on this project was definitely my "curtain rod" shoe and scarf storage idea using Racka Rods and Wall Brackets from Ikea which totalled a mere $33.00! 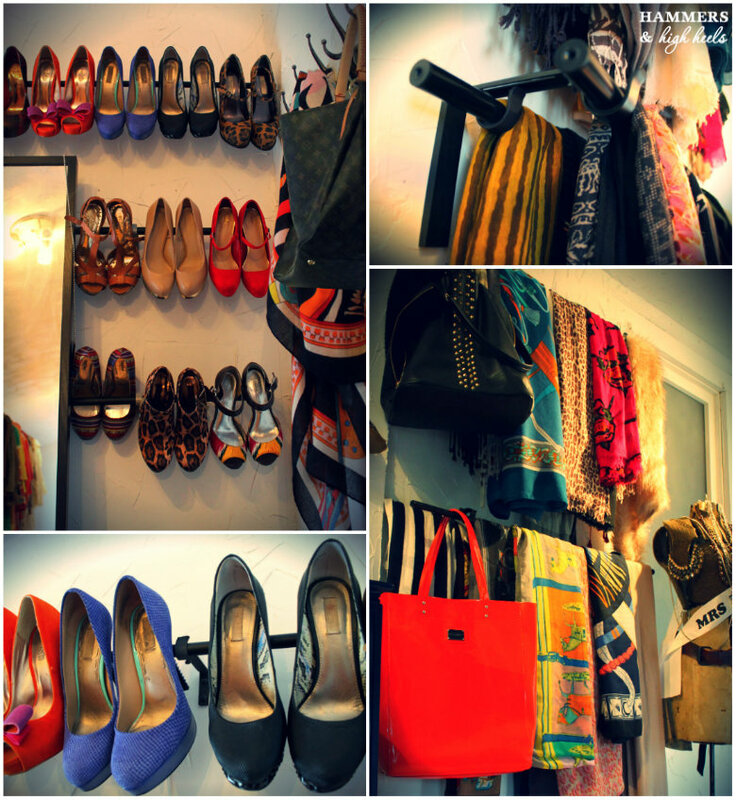 I said it before and I'll say it again- Every gal needs a place to hang her hat heels right?! However now that I'm thinking about it, if given the choice I'd prefer Andy Cohen to have that gig. Then I would come home to Real Housewives gossip and "Drinking Game Alerts!" Ahhhh! Yep, this is what goes on in my head sometimes, could be worse though right? 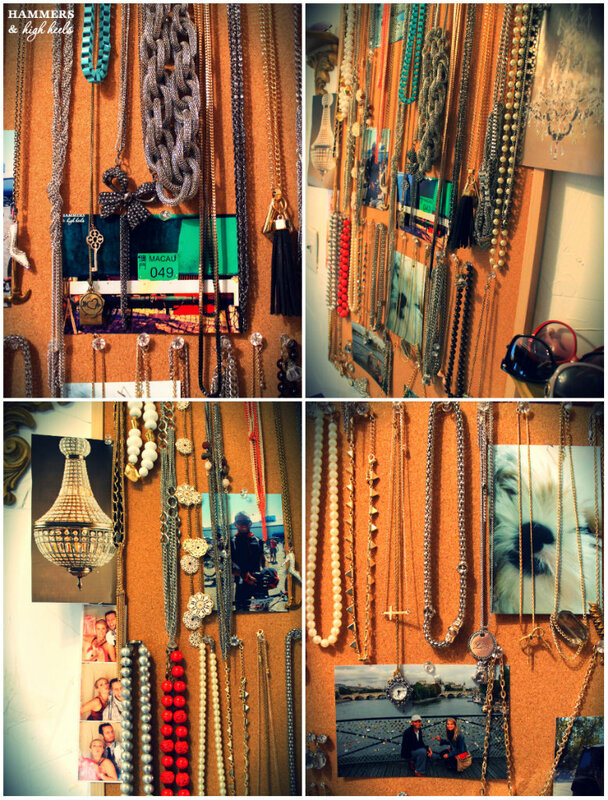 For jewelry storage, I decided to turn it into wall art using a $9.99 cork bulletin board from Menard's. 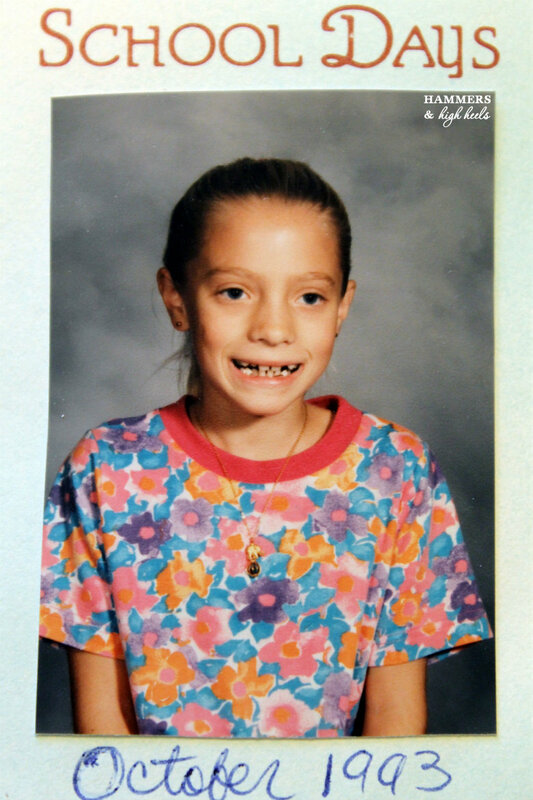 I also pinned on some fun photos that make me smile every morning. Isn't the close up of Rocco's little fuzzy face adorable?!?! 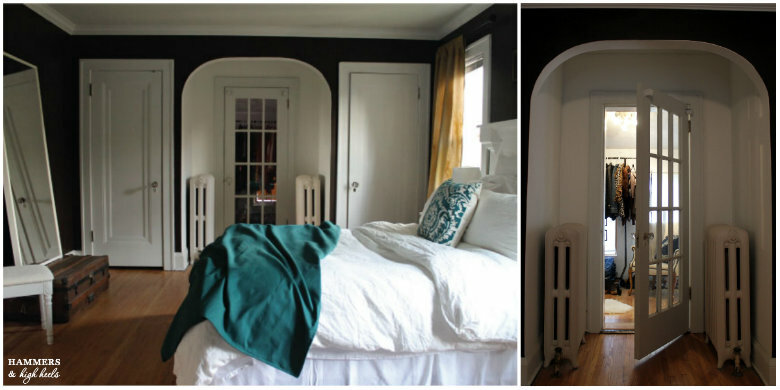 You might have also noticed that I changed up my DIY Greek Key window shades a little. I decided to ditch the violet color and go with classic black instead. I also found that using 3M Friction tape is way better than the vinyl! Each roller shade was $14.25 from Home Depot (they cut to exact length you need) and the Friction Tape was about $5.00. The Friction Tape was more like fabric so in the end it did look much better, especially against sunlight! 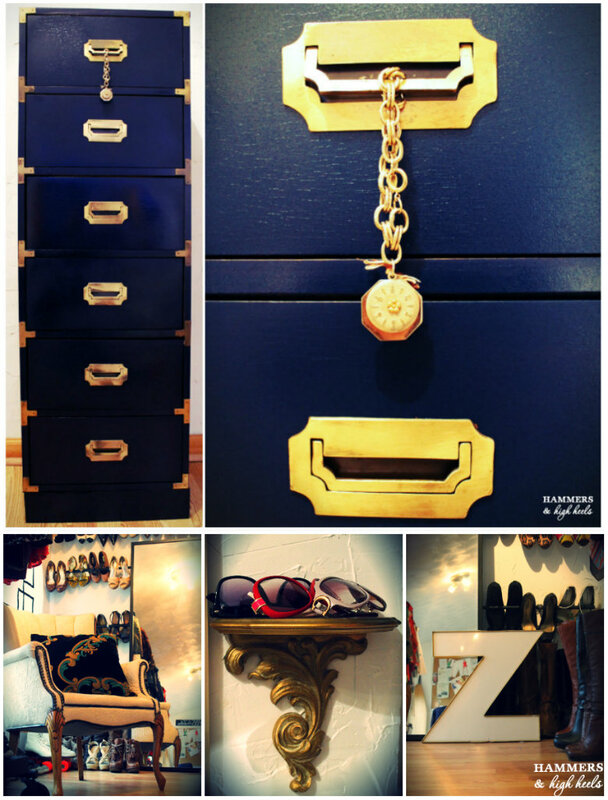 The vintage/thrifty finds that helped give it a personalized touch were the campaign dresser $10.00, antique armchair $2.00 (followed by a DIY facelift), oversized "Z", and the set of gold wall sconces for $2.00. The decorative pillow, sheepskin rug, and canvas storage baskets were all things we had in our guest or soon-to-be office. The bright side is that I didn't spend more money, but I also never fell in love with anything enough to purchase for the closet like I had hoped. At least for now they seem to fit nicely and maybe I'll find replacements when I am not looking (I hope)! So, maybe someday I will have the Lisa Vanderpump closet of my dreams, but for now opting to turn a small room into a large closet seems to be a fantastic solution! Do you agree? What do you think of my DIY Closet set up? 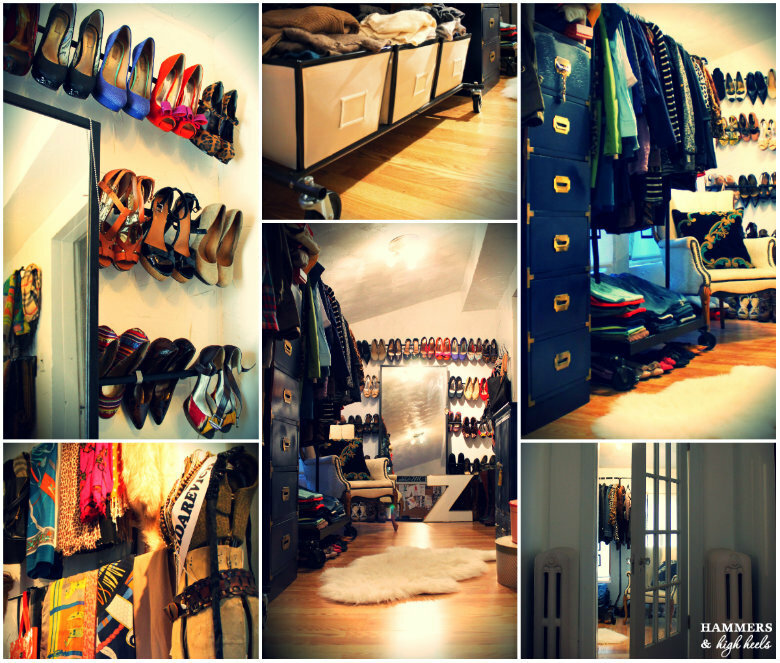 Would you do the same if you had extra rooms and only small closets available in bedrooms? What other storage ideas do you think I should add or could add over time? Lastly (and it's the most important one to answer), did you like my Hammers and High Heels Comic? * Updated on 5.28.2013- noted black-out film on windows that sit behind my garment racks, protects clothing so the sun cannot fade them. Clean the gutters... Last fall and perhaps earlier this spring. Whoopsie!!! 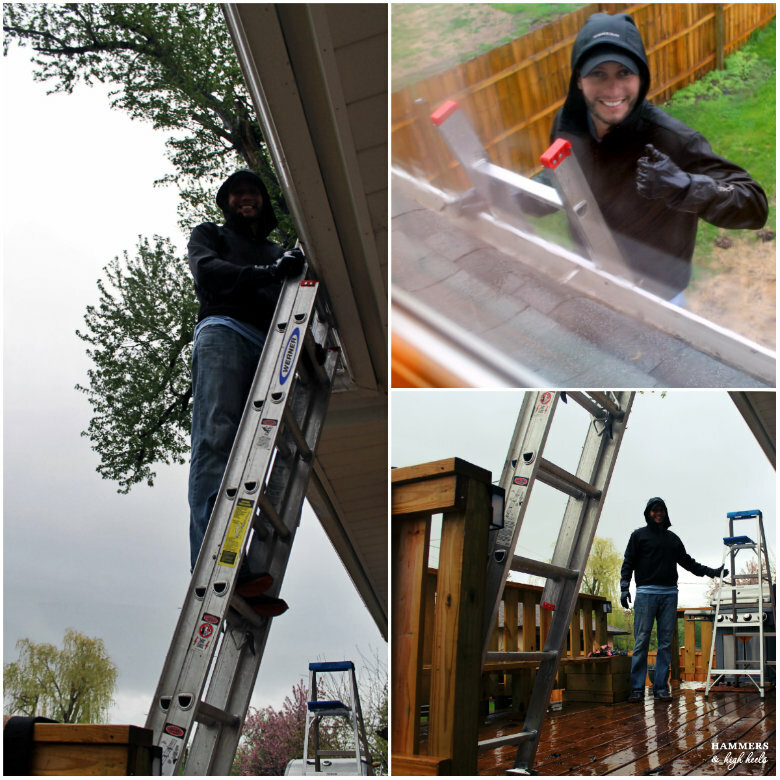 Alex decided he had better hop on a ladder and clear the way so water could travel out of the downspouts and away from our home's foundation. At least he looked pretty cheery doing it right (or it was because he had just downed a Venti Starbucks and was amped on caffeine)? I guess we're getting those April showers now just in time for June flowers? At least our gutters are now ready for the spring/summer rain and storms! Guess it reminds us to always be ready for severe weather during this time of year- outside and inside our home. Hope everyone else in this same band of rain and severe storms across the Midwest is staying dry and safe! Hello and happy Friday! I have a sort of Summer DIY decor post for you today, because honestly I'm confused about whether we are in spring or summer right now. It feels like we just skipped over spring and went right into summer here in Minnesota, does it feel like that where you are? I know Memorial Day is next week which is the official start to summer, but heck it was freezing a week or two ago so let's just call it summer I say! 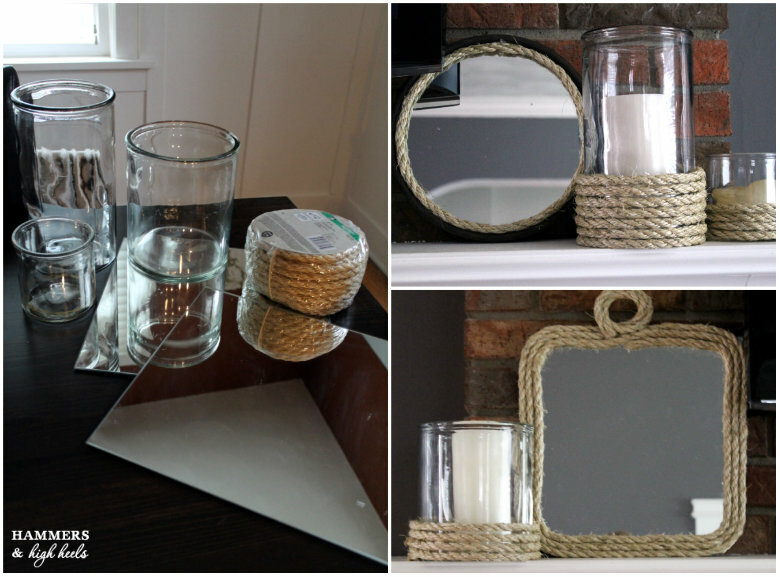 Now onto my summer styled DIY project- Rope Mirrors and Candle Holders! I've been seeing a lot of home decor made with rope lately and figured I could add it to some mirrors or candle holders at home. 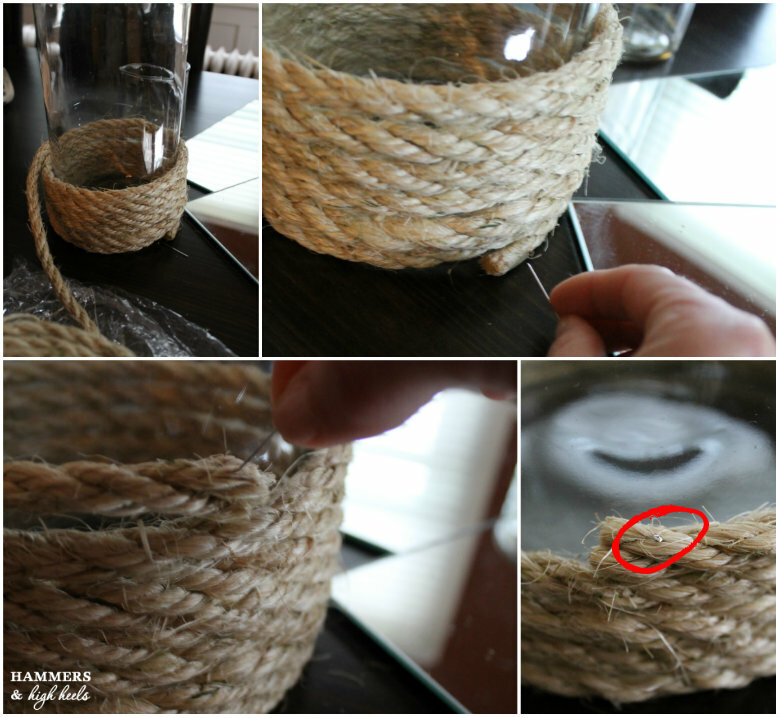 So, I grabbed some Sisal rope from Home Depot for just $8.81 to add onto three glass candle holders and two mirrors I had at home. For the candle holders, all I did was wrap the sisal rope around a few times and then pinning the ends to hold them on (no glue required on these!). The mirrors were a little trickier and required the use of a hot glue gun. I cut enough rope to go around my square Ikea mirrors three times with a bit extra to loop at the top. 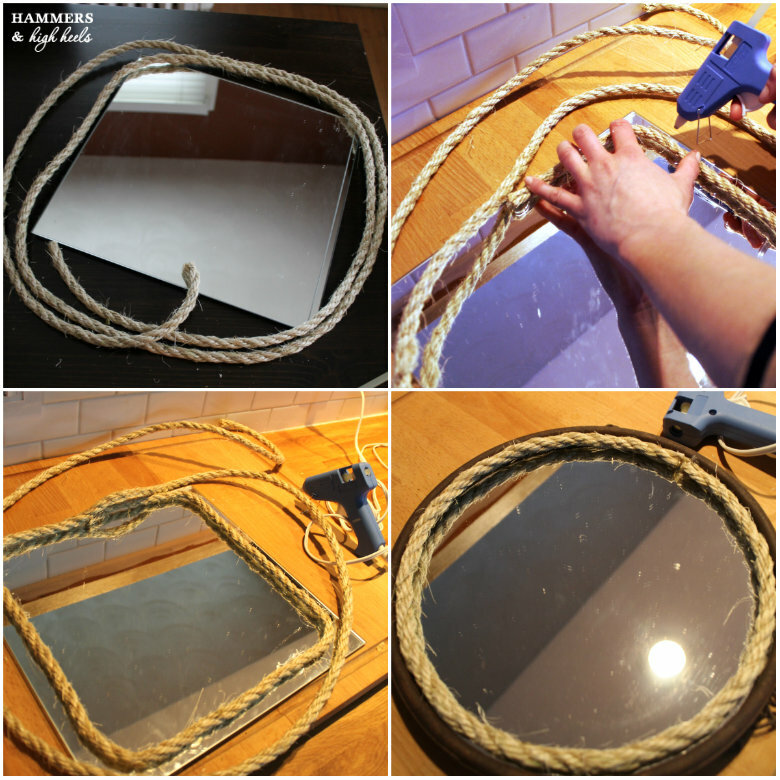 I glued the rope in place around the edge of the mirror (shown in images below). For my round mirror it was a bit easier. I just placed cut rope on the inner edge of my mirror and glued the ends together. 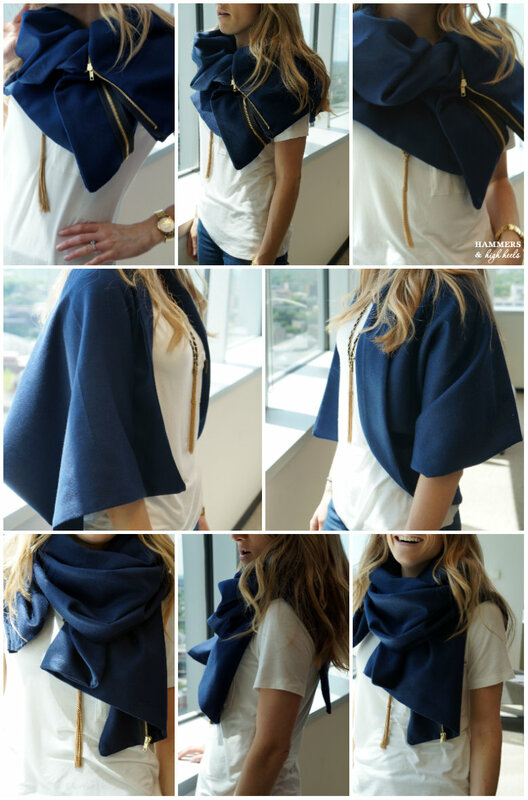 I'm Head Over Heels for this simple DIY's, are you?!?! What could I add to the mantel or fireplace itself that would add color and compliment the rope/summer theme? Thank you to everyone that posted a comment on our 3rd blog-o-versary post! But before I get to the giveaway winner I have to tell you that I loved reading the comments as they rolled in! Some comments were really sweet and it was helpful to get feedback on what kind of posts you enjoy most or how you found us in the first place. 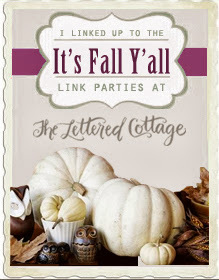 It was fun that a couple of you mentioned the room redo we got from Kevin & Layla of The Lettered Cottage and have been reading along since (mostly because before that my mom and sister were our only readers!). But we also loved to hear that some of you have a similar style/older house or that you live nearby (neighboring states count too!). Congrats Susie! the winning random number was 4 and your comment was the lucky 4th posted! Please send me an email with your mailing information and we will get that Home Depot gift card sent out! Now onto a different topic (which is very different than any of our posts ever before) the Minnesota Twins! I have to tell ya that we are majorly distracted this week because we went to a Twins game Monday and I went to another at noon today! Woo-hoo! Nothing makes spring/summer feel more fun that a good-ol baseball game out in the sunshine! 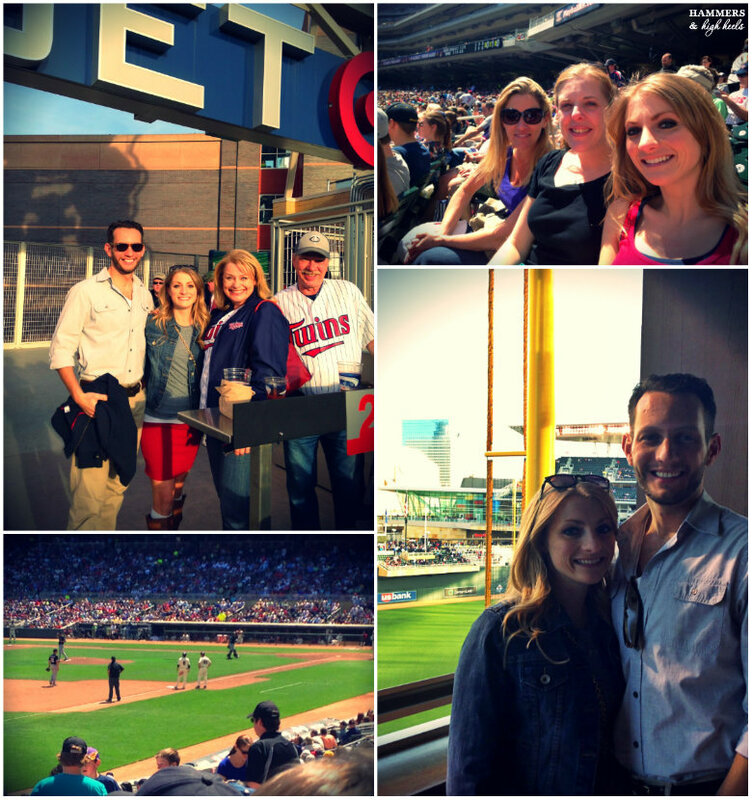 But I think I might have learned the best kept secret at Target Field thanks to my neighbor Chris on Monday! Did you know there is an actual organ player on the 4th level inside the 2 Gingers Bar?!?! Well, now I must admit I'm kind of tired and sunburned so I'll call that's a wrap for today! Any other local folks go to the Twins games this week? Did you know that there was a real organ player at the stadium or did you think it was a recording too? 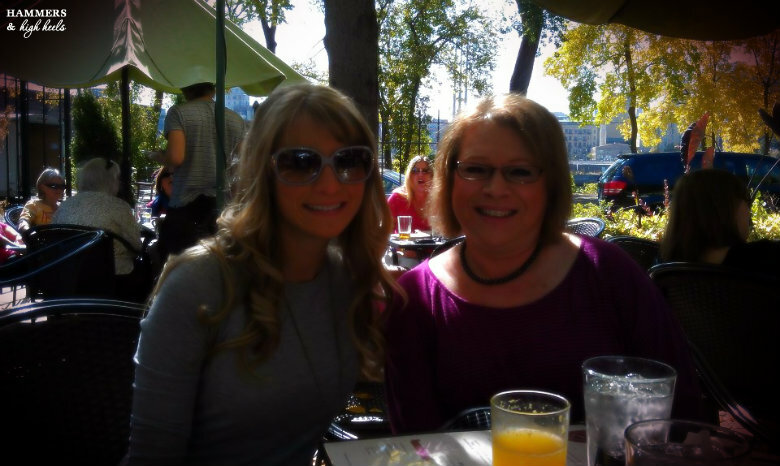 It is a GORGEOUS Friday here in Minneapolis, makes me excited to kickoff the weekend! 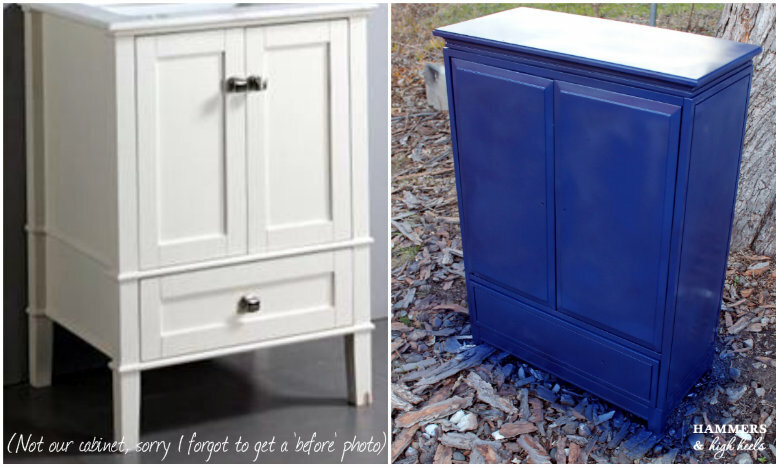 This week's DIY is a pretty simple furniture redo that I just had to do because of how much I loved my updated navy blue campaign dresser. It totally needed a buddy right? The only bummer about this DIY is that I missed a MAJOR step- yes, I forgot to take a "before" photo. I know, I know, how the heck could I miss that?!?! I am wondering that too, but the cabinet was just white before with silver hardware so I found a similar looking cabinet online to give you an idea. It was a cabinet that the previous homeowner had in our upper level bathroom. We didn't need it in the space so it was just stored in our basement... Until now! 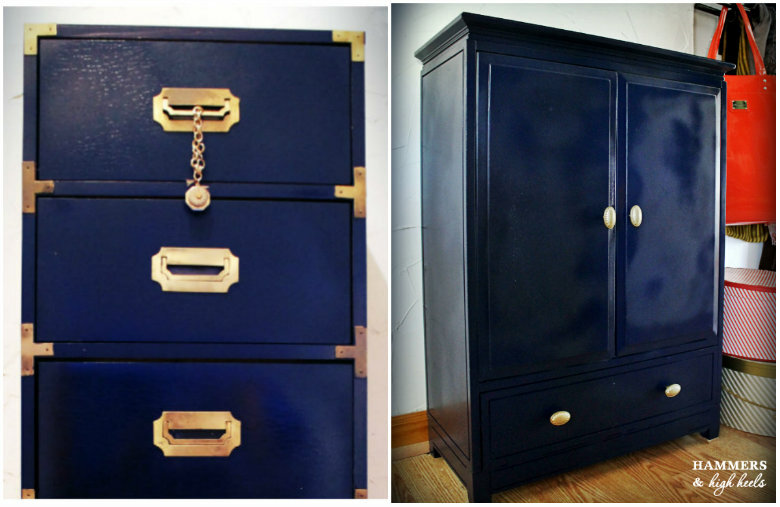 I removed the hardware and used the same Rust-o-leum glossy navy blue paint that I used on the dresser. For the hardware, I actually had some old knobs that had a unique look so I just painted them gold to match the dresser. I figured they would work fine since I couldn't get or fit the same hardware that was on the campaign dresser. I cleaned it off, added the hardware, and brought it up to my closet room. Here's how it's looking! I think just that little bit of extra storage was the missing puzzle piece for my Closet-Room redo (I still need to take all the 'after' photos though, stay tuned!). I know I am Head Over Heels for this DIY, especially because it was free and I put some clutter from our basement to good use! What do you think? 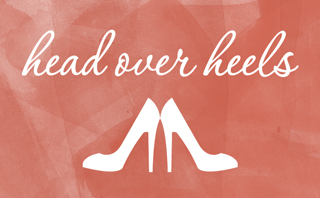 Are you Head Over Heels for the revamped look? 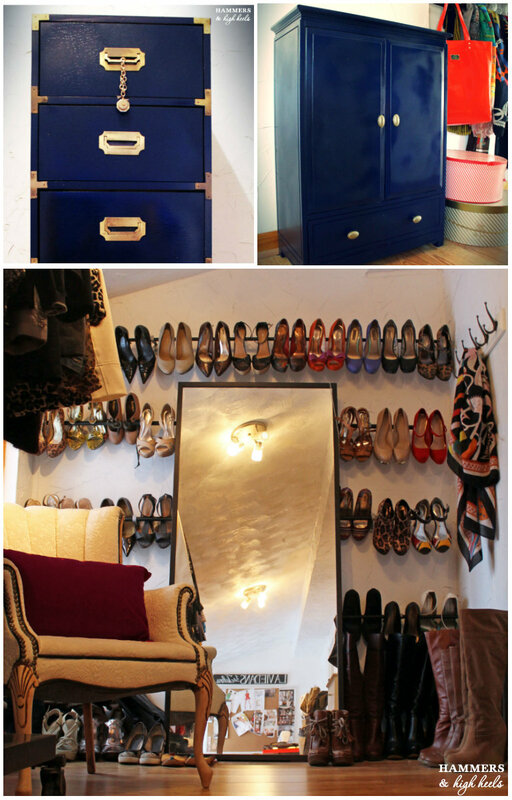 Hope you will be back to see the full Closet-Room "afters"! Before I go, in case you missed our 3rd Blog-a-versary post be sure to check it out and leave us a comment to win a $25 Home Depot gift card! For those that already left us comments, thank you so much! They have been really fun to read and make me so happy for keeping up with the blog :) We will announce the winner on Wednesday, May 15th.